Tens of thousands of votes in the Holyrood election were rejected by the counting machines without any human adjudication, BBC Scotland has learned. 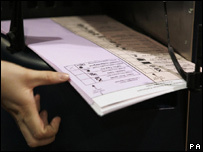 An investigation has established that the machines were programmed to reject some of the new style ballot papers automatically. They never appeared on the screens to be challenged by the parties or adjudicated by returning officers. The Scotland Office said there was no evidence it added to voter confusion. It added that, in the instance of auto-adjudication for the 3 May election, the decision was taken between returning officers and the e-counting provider. However, First Minister Alex Salmond described the development as "astonishing" and deeply disturbing. "I was under the impression - until this revelation - that the ballots that were rejected were actually seen by the election agents as part of the process," he said. More than 140,000 ballots were spoilt on 3 May when votes were held for the Scottish Parliament. Tens of thousands more ballots were rejected for the local authority elections, which were held on the same day, under a separate electoral system. One of the enduring images of election night was of candidates and agents scrutinising screens showing the rejected ballots. However, the BBC has learned that in some contests, more than half of all the "spoilt" ballots were rejected without any human adjudication. The machines were set to auto-adjudicate if they thought they had a Holyrood ballot paper with a cross in one column but apparently no mark in the other. In those circumstances the machine would count the good vote, reject the other one and automatically put the ballot paper in the pile alongside all the correctly-completed ballots. Shadow Scottish secretary David Mundell said he was "appalled" by the claims. "Unfortunately it has become part of a series of revelations. Right from the start the Scotland Office did not come clean about the mishandling of the elections," he told BBC Scotland. The Tory MP claimed that information had to be "dragged out of" the Scotland Office. He said: "Rather than putting their hands up and saying 'we made a complete hash of this and we apologise to the people of Scotland', they've just continued to show arrogance and contempt, as if somehow it was nothing to do with them." Mr Mundell's Lib Dem opposite number, Alistair Carmichael, added that the auto-adjudicate decision was "inappropriate". "Individual decisions should have been taken by returning officers in consultation with the machine operating company," he said. A spokesman for the Scottish Green Party said that the review of the election must leave no stone unturned in order to get to the bottom of the problems. He added: "We are particularly concerned that the review of the election may only look at samples of rejected ballot papers rather than all of them. It is important that the review is absolutely thorough." A special Newsnight Scotland programme - Did Your Vote Count? - will be screened on BBC2 Scotland at 1900 BST on Monday.